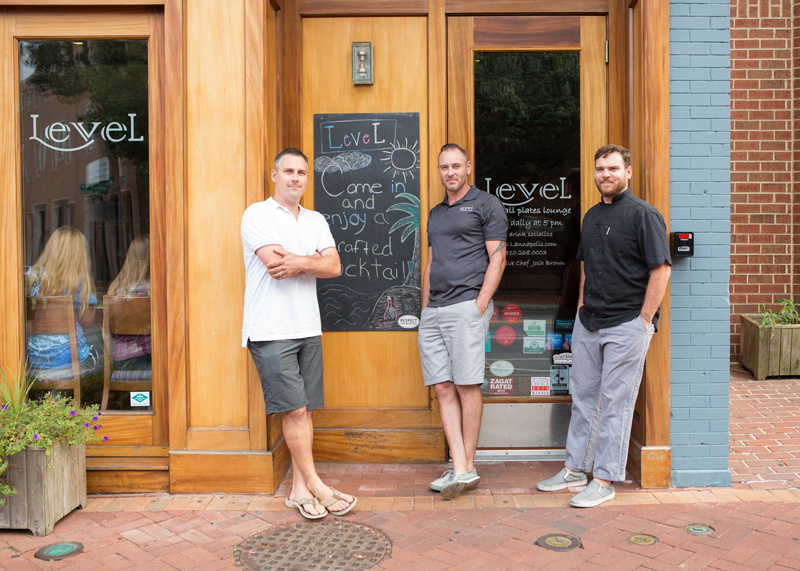 “This restaurant re-creates how we grew up,” says Andrew Fox, who co-owns Level – A Small Plates Lounge with his older brother Chris and their business partner, John Miller. The Fox brothers grew up with 14 siblings. “It’s hectic, it’s noisy, there’s a lot going on. My mom cooked foods from scratch, and a lot of us got into cooking,” says Fox. He appreciated the effort that went into preparing the meals, and it was a characteristic he intentionally infused into the restaurant. Level’s guests can see the effort and care with which their food is prepared because of the open kitchen setting, just as if they are in the family kitchen. He wants customers to feel as though they are coming over a friend’s house for dinner. “I want my customers to say they were welcomed here,” says Fox. Social dining is the overarching concept, not only at Level, but also at the partners’ two other Annapolis restaurants, Vida Taco Bar and Fox’s Den. They encourage guests to share their small-plate-cuisine meals family style; this was how the Fox family ate in restaurants even before small plates were popular. Growing up in a large family in part shaped Fox’s work ethic. His father died when he was 15. He went straight to work after that, out of financial need, and by the time he was 17, he was working in local restaurants. 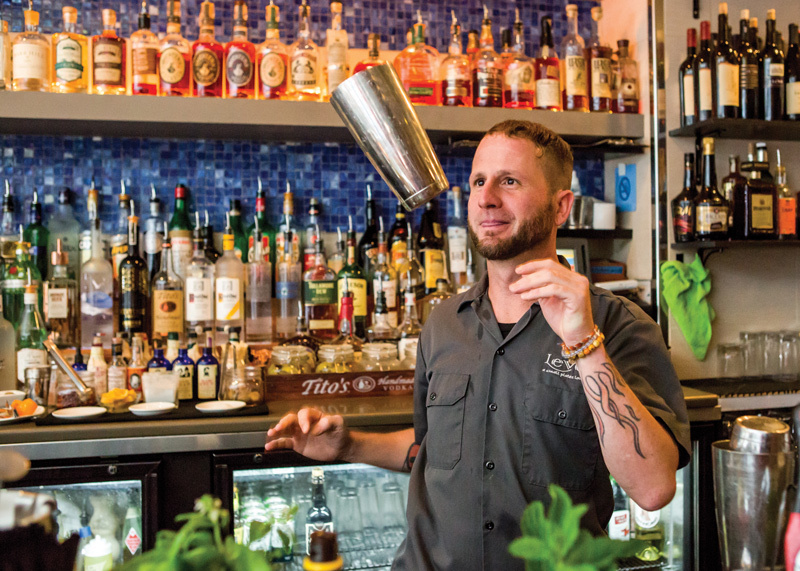 Fox always felt that working in the restaurant business would be temporary, and he enrolled in University of Maryland, College Park to pursue a career in the financial industry. He saved his shift money, earned at Pusser’s Caribbean Grille, in a purple Crown Royal bag, and paid for each semester one bag at a time. 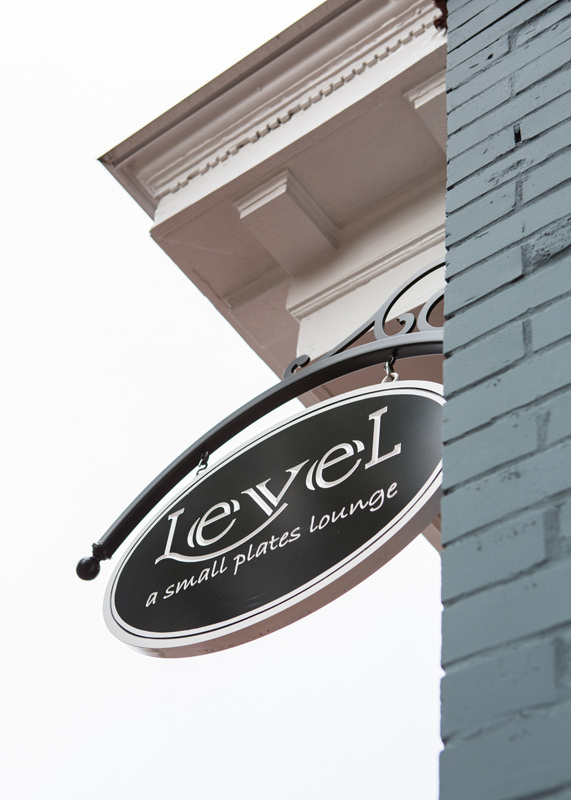 Level is named after the aspirations of its original founders—Andrew, Chris, John Miller, John Hogan, and Alfredo Malinis, Jr.—who all wanted to raise the level of expectations for restaurant service, quality and customer experiences in Annapolis at the time of its opening in 2009. The name also served as a pledge of accountability to each other to strive for a higher level of performance. Eight years later, the concept-eatery is thriving, with an influx of local diners seeking an inspired dining experience. “Honestly, I saw us as pioneers of what was coming. No one was doing small plates back in 2009, in Annapolis. Now, the whole food scene is wrapped around social dining,” says Fox. 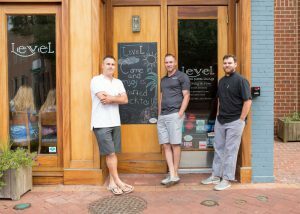 “Level’s food is comfort food,” explains Fox. Its menu appeals to a wide range of palates and keeps locals coming back to have another taste, knowing they can have a different dining experience with each visit. 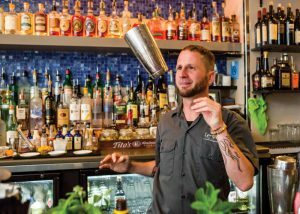 Level changes its menu of fresh-fruit cocktails three times a year and its regionally, seasonally, and globally influenced food menu four times a year. “If you change with quality, your clientele wants to come back and try new things,” says Fox. On the current menu, diners looking for a hearty meal can pair a craft brew with a plate of apple butter barbecue ribs smothered in rosemary onion jam. 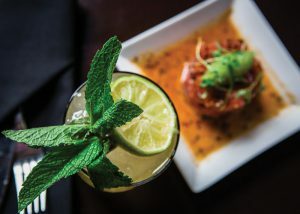 Those opting for vegetarian fare can indulge in summer vegetable spring rolls with a low-calorie, fresh juice cocktail; the Lychee Martini is just one of this summer’s offerings. A craving for seafood can be aptly satisfied with pan-seared scallops with a bacon hollandaise, accompanied by a flavorful Pinot Grigio. Executive Chef Josh Brown sources Level’s products from local and sustainable farms. Pork is brought in from Papa Weaver’s in Orange, Virginia; tomatoes are supplied by Hummingbird Farms of Ridgely, Maryland; and dairy products are provided by South Mountain Creamery of Middleton, Maryland. “Josh has a really good eye for food. He is trained in a lot of different types of cuisine,” says Fox. Brown oversees food for all of the partners’ restaurants. Vida Taco Bar will open new locations in Severna Park and Baltimore later this year and in 2018, respectively. Error: Error validating access token: Session has expired on Saturday, 09-Mar-19 15:57:50 PST. The current time is Tuesday, 23-Apr-19 08:50:22 PDT.